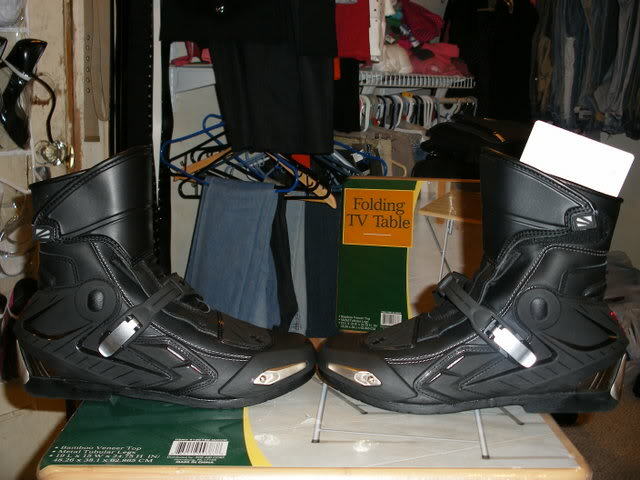 I was looking around for a while for some boots that are good to ride in, provide good protection for ankle, heel, and lower leg, that are comfortable to wear and won't be too heavy. 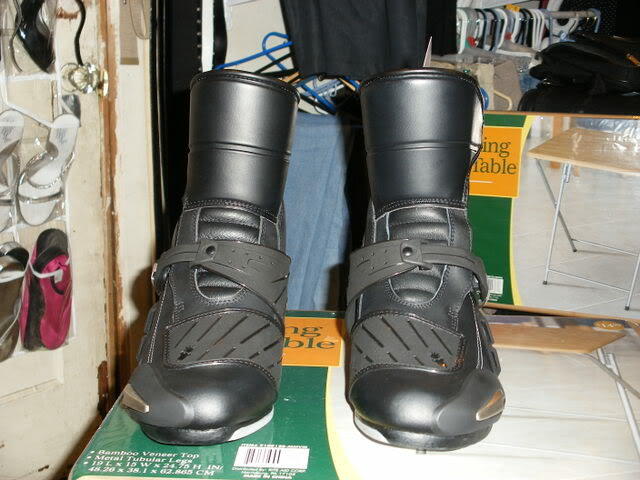 Now I know that motorcycle boots are not meant to be walked in for distances while off the bike, but for a commuter, having safety and comfort will go a long way when needing to walk around some when off of the bike. 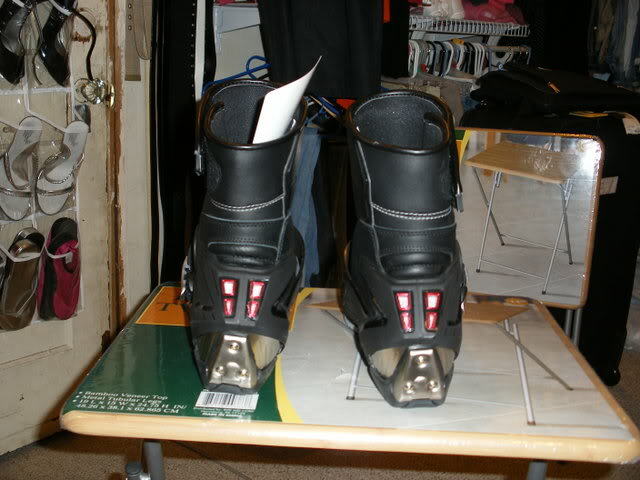 So, I recently decided to purchase some Joe Rocket Super Street boots. They were purchased from Newenough (www.newenough.com) and shipping was nice and fast. The boots were had for $146.00. The boots are stylish and protective, yet light and durable. I have not yet ridden in them, but tried them on and walked around the house in them and they will work for me. 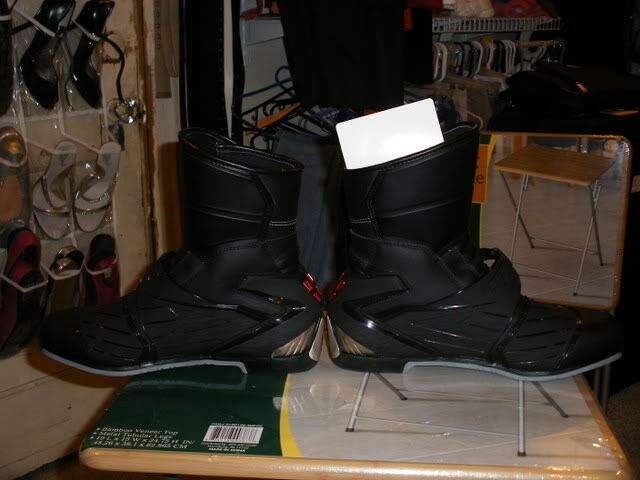 They are a bit stiff (given that they are new) and slightly because of the way that the ankle support is designed. The boots come with two types of adjustment, an ankle strap and a lower buckle. 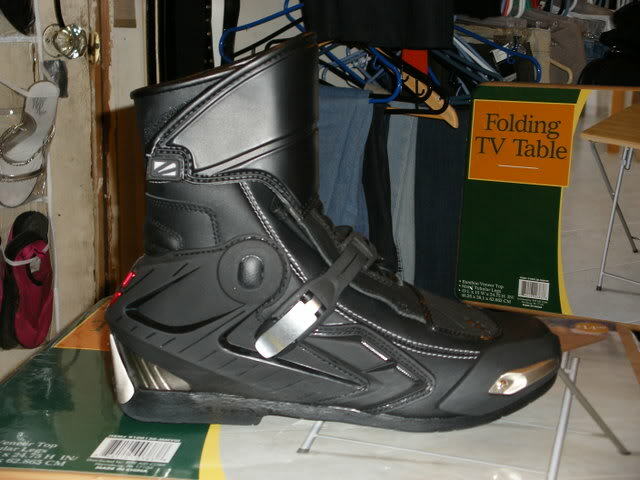 The boot also comes with removable and replaceable toe sliders (although I won't be using them) and a replaceable heel protector. These boots are made well from the sole to the stitching to the molded plastic/leather protection combo. They are about as heavy as some regular timberland boots, but not too heavy to cause fatigue when wearing them for a while. All in all, these boots offer a lot of protection and support while being shorter than a standard calf-high racing boot. These boots are going to be for the days that I commute to school and will walk in them all day on campus (a small campus). And, although they are stiff, they still will be a better choice to have as a commuter boot than my AGV Sebring 2 sport boots. For sizing, I wear a 10 - 10.5 in regular tennis shoes and I ordered a size 10 in these and they were right on being snug and comfortable with any movement. Last edited by supersnake83; 01-28-2009 at 01:43 PM. 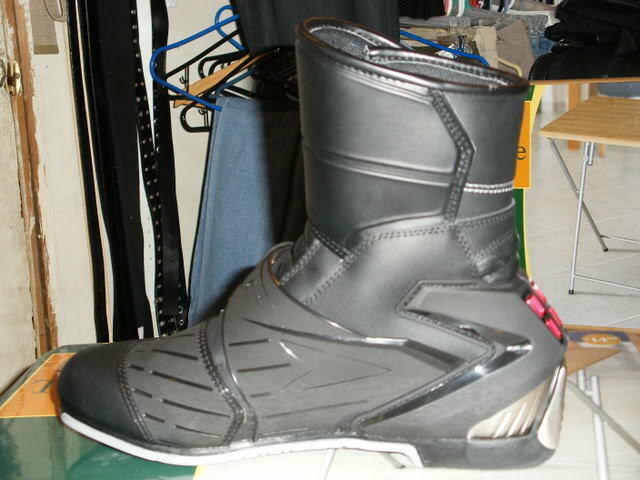 I also have these boots and find them to be very comfortbale for riding and walking. I think Joe Rocket makes many items that are comfortable and reliable to wear when it comes to riding. I think Joe Rocket makes many items that are comfortable and reliable to wear when it comes to riding. I am just beginning to learn about Joe Rocket Gear. Since I an new to riding, I am trying to find the best fit/comfort/protection for the money and for boots, I think these are top-notch! I also like the feel of Teknic jackets being tapered for fit versus being bulky or large. I just purchased the Teknic Chicane leather jacket too, being only 149.00. That was a closeout price and this jacket can still be had by some online vendors and local places ordering them from catalogs for 299.99.
wow, those thing look awesome, i may have to pick up a poir of those !!! ... because I don't think the one's hanging on your door are going be nearly enough protection in a get-off. Those are my wife's shoes and that rack is filled with 20 pairs of shoes, slippers and the like. There is another one on the other side of the door that is also filled up. Women and their damn shoes. I don't get it and I don't think that I will ever get it!